☆ Manage cable at the front and rear of racks for managing cable installations in an extremely neat appearance. ☆ Maintain cable bending radius. ☆ Available in both 1U and 2U options. ☆ Fit for data patch panels & 110 patch panels . ☆ Metal and plastic type for selection. ☆ Normal types & duct types for selection. ☆ Large capacity duct for managing cables quickly. 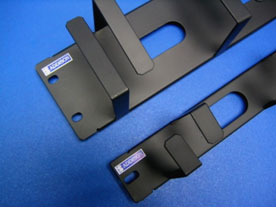 ☆ Mounting to standard rackmount 19" racks. ☆ Manage patch cords, providing appropriate route for the horizontal or backbone wiring and patch cords. ☆ Each cable management panel can work independently, not interfering with other cable management panels. be managed quickly at the rear part, thus providing effective cable management in a compact environment. ☆ Metal design enhances the product durability. ☆ The special routing design of the panel can maintain the bending radius of the cables effectively. AD-RP-M-FR-1U 1U Cable Management Panel (Metal Type) with rings at the front and rear 1.8"×19"
AD-RP-M-F-1U 1U Cable Management Panel (Metal Type) with rings at the front 1.8"×19"
AD-RP-M-FR-2U 2U Cable Management Panel (Metal Type) with rings at the front and rear 3.6"×19"
AD-RP-M-F-2U 2U Cable Management Panel (Metal Type) with rings at the front 3.6"×19"
AD-DP-M-FR-1U 1U Duct Panel (Metal Type)-with ducts at the front and rear 1.8"×19"
AD-DP-M-F-1U 1U Duct Panel (Metal Type)- with 1 duct at the front 1.8"×19"
AD-DP-M-FR-2U 2U Duct Panel (Metal Type)-with ducts at the front and rear 3.6"×19"
AD-DP-M-F-2U 2U Duct Panel (Metal Type)-with 1 duct at the front 3.6"×19"
AD-110WM 110 Cable Management Panel without legs 3.6"×19"
AD-110-WM-L 110 Cable Management Panel with legs 3.6"×19"
AD-110-WM-1U 1U 110 Cable Management Panel without legs 1.8"×19"